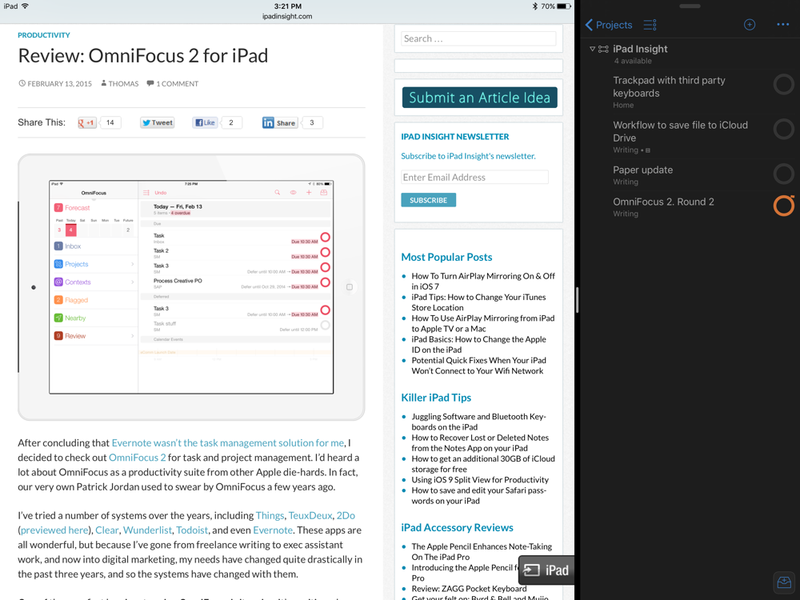 I reviewed OmniFocus 2 for iPad earlier this year and found it lacking when it came to the batch management of tasks. There are a lot of different ways to view and manage tasks on the iPad version, but the desktop still leads the pack of OmniFocus apps because you can select multiple tasks and defer or re-assign them in batches. I think the developers at OmniGroup set this limit on purpose in an attempt to focus on the strengths of each platform, but I’d argue that there’s more than enough room on a 9.7“ and 12.9” iPad screen to pull off batch task management. However, despite that criticism still holding true, I’ve been giving OmniFocus 2 another shot over the past few weeks — and I’ve been liking it! A big reason behind this second attempt is the iPad Pro. OmniFocus’ design looks so wonderfully clean, and the included Night Mode makes the app so unobtrusive that it’s easy to just keep it as an always-on companion in Split View on the iPad Pro. I really like working this way on the iPad. I have my main app on the left side and OmniFocus as a minimal Split View app on the right, allowing me to just jump from task to task very easily. This workflow will only get better ad more apps support Split View on iOS 9. I’ve also tried a new approach to OmniFocus’ lack of batch task management: I’m using the Inbox a lot more and ignoring the Forecast view. Every time I think of a little task I want done, I’ll throw it into the inbox without any due or defer dates. I’ll clear the inbox out whenever I have time, but I’m not too fussy about it any more. The act of capturing the task in OmniFocus is already enough to give me peace of mind. Ignoring the Forecast view has been equally helpful in this second round with OmniFocus. I loved the idea of the Forecast view when I first saw it: seeing Past, Due, and upcoming tasks on a mini calendar seemed to mirror my thinking beautifully. However, I just can’t wrap my head around the way that the Forecast view treats deferred tasks (OmniFocus’ version of start dates). If a particular task’s deferred date comes and goes without my having completed it, it completely disappears from the Forecast view. However, based on my quick research, it seems this view is working exactly as OmniGroup intended, and it’s not likely to change any time soon. Knowing that, I’ve decided to stick to the Projects view and limit what I see by deferring everything I’m not actively working on. This keeps my Projects view clean and manageable, while still capturing any tasks for which the deferred date has come and gone. I realize how technical that can sound if you’re not am OmniFocus user yourself, but suffice it to say that his new approach allows me to watch one area (Projects) and reliably keep an eye on all of my upcoming and overdue tasks. That’s what I wanted out of the Forecast view, and I’ve managed to recreate it elsewhere within OmniFocus. I do still wish that certain actions like assigning Projects and Contexts could be accomplished with fewer taks, but there are few other apps that blend into the background in Split View as OmniFocus 2 does, and that feature alone has been a great reason to revisit this app on the iPad Pro.